Over the past 20 or more years collaborative decision making (CDM) in air traffic management has become a fundamental principle underlying all new air traffic management (ATM) system development in the U.S. However, most CDM-based development has focused on tools and processes to support very specific ATM operational decisions, such as assigning ground delay to a specific flight during a ground delay program. Another form of CDM consists of strategic planning telcons (SPTs), in which FAA traffic managers consult with flight operators in planning operational strategies for the day. Whereas significant resources have been invested in various CDM-based decision support tools to support the tactical planning and control of traffic management initiatives, the SPTs and strategic planning in general have received less R&D attention and, as a result, remain largely unstructured. Under this project a mechanism has been developed to determine a consensus service level expectation vector that provides strategic input into the design of air traffic management initiatives (TMIs). The approach, which employs the Majority Judgment voting mechanism, enables those flight operators impacted by a potential TMI to provide input to the FAA to guide the design of the TMI. The output of the process is a numeric vector that specifies performance goals for the TMI enabling the TMI designer to tradeoff competing performance criteria. Team: Massachusetts Institute of Technology, University of California, Berkeley (UCB), University of Maryland (UMD). PI: Michael Ball (UMD); CoPIs: Cynthia Barnhart (MIT), Mark Hansen (UCB). Researchers: Lei Kang (UCB), Yi Liu (UCB), Prem Swaroop (UMD), Vikrant Vaze (MIT), Chiwei Yan (MIT). The ADSIM model is a general-purpose airport capacity and delay model developed by the FAA Technical Center. ADSIM Plus is a new version of the model developed under sponsorship of FAA ATO NextGen Systems Analysis to make the model suitable to study future concepts of operations. The new model has a well-developed GUI and two modes of operation. Virginia Tech is studying the model to advise FAA on ways to simplify the model inputs using existing databases and improved algorithms. The Virginia Tech effort is also validating the results of the model for consistency with other simulation and modeling tools. The results of this effort will provide the FAA with recommendation to upgrade the ADSIM Plus model and simplify the input data entry effort. This will make the model more usable for FAA internal studies and eventually provide airport planers with a powerful tool to estimate airport capacity and delays at airports considering future NextGen concepts. 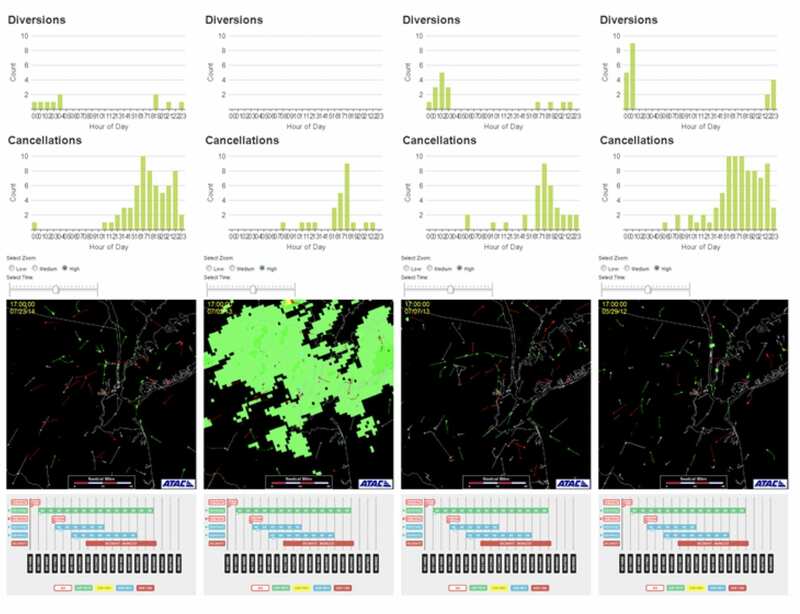 The practice of programming response strategies for inclement weather and other network disruptions for the National Airspace System relies heavily on user experience and memory of previous situations and solution attempts. An ever-increasing quantity of supporting data and related services make it more feasible to transform this effort into a more data-driven decision support process. The purpose of this NASA sponsored project was to investigate ways to mine historical data on air traffic, weather, network status, and other variables. In particular, in the context of a given day’s predicted conditions, a computerized system was developed to determine a set of historical days that were similar. There are different notions of similarity for traffic, weather, and other variables, and these needed to be combined into a single metric. The ultimate list of historical days might still be too extensive for a human operator to peruse efficiently, so statistical machine learning techniques were adapted to determine, for a large set of historical days, a smaller set of representative historical days, which essentially could represent the full menu of history-inspired solution strategies. Together with the actual performance statistics of these strategies from their past implementations, these could be presented to the user compactly as candidate solutions for the current situation.